Pacola and Socolow have shown that there are several established ways by which we can hold CO2 emissions at a constant level. Wind, solar, nuclear, carbon capture and storage, and fuel savings in transport are all methods that could make a significant difference soon. However, these all require a determination by governments and a realization by the public to curb our CO2 emissions immediately. The Kyoto Protocol is a step in the right direction but needs all nations to be involved, and the rate of CO2 abatement needs to be speeded up. Finally, CO2 reduction can be obtained by enhancing natural sinks on land. Ending deforest­ation by 2055 and replanting some 250 million hectares of tropical forest, or a slightly larger area of plantations, would produce one wedge. When land is tilled for replanting, about half of the stored carbon in the soil is lost, mainly through aeration. Extending conservation tillage, in which seeds are planted without re-ploughing the land, to all the world’s cropland, coupled with using ground cover crops that help prevent soil erosion, would provide a further wedge. Switching about 1400 GW of power from coal-fired to natural-gas-fired plants would also provide a wedge, since the amount of carbon from gas per kWh is about half that from coal. Of more long-term importance is the identification of a wedge from increased carbon capture and storage (CCS). One technique first produces hydrogen and carbon dioxide from the fossil fuel. The hydrogen is then burnt to provide power, or could be used in fuel cells, and the carbon dioxide is stored underground. Another technique separates the C02 from the flue gas and then compresses it before pumping it underground. Currently, C02 is injected into oil reservoirs to enhance oil recovery (EOR). An increase of about 100 in the amount of EOR would produce another wedge. Fig. 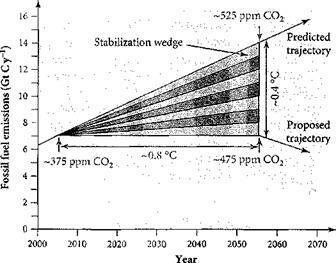 11.4 Predicted and proposed carbon emissions using stabilization wedges. Future CO2 levels and temperature rises based on simple linear model (see text). example, installing compact fluorescent instead of filament bulbs could provide a quarter of a wedge. constant fraction of close to a half is absorbed by the Earth during this period, as has been the case over the last 50 years, then we would estimate the level of CO2 to rise to around 475 ppm. After 2055, Pacala and Socolov assume that the amount of CO2 would fall linearly until there is no net gain per year after 2105. In our simple model the effect of this would be that the level of C02 would stabilize at around 525 ppm. A renewables obligation is a mechanism set up in the UK to promote the growth of renewable energy. It requires electricity suppliers to obtain a specified fraction of their energy from generators using renewable energy sources. This fraction will increase to 10% by 2010. The obligation sets up a market in tradeable green certificates (renewable obligation certificates, ROCs). Suppliers have to buy a certain number of ROCs to show that they have obtained the specified fraction of renewable energy. This they can do by buying ROCs directly from the renewable generator or on the open market. Alternatively, they can pay a buyout price of 3 репсе/kWh to make up any shortfall. reduce emissions and applies to transport, domestic consumers, and industrial consumers. It also demonstrates the importance attached to reducing global warming by the government concerned. It is more costly for countries with less efficient energy usage, which was why the United States was in favour of emissions trading rather than a carbon tax.